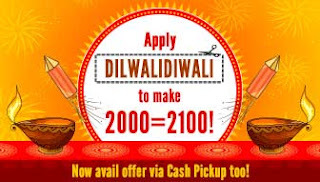 Mobikwik DILWALIDIWALI Offers Rs. 2100 On Adding Rs. 2000 in wallet. Get Additional Rs. 100 On Rs. 2000 By Adding Rs. 2000 In Your Wallet. Use The Coupon Code Given To Get Additional Rs. 100 On Rs. 2000. Get Additional Rs 100 On Rs 2000 By Adding Rs 2000 In Your Wallet. Extra cash Amount is fixed at Rs. 100/- for a Minimum Add Money amount of Rs.2000. Sign Up platform any , Coupon Redemption and Payment should be done on iPhone, Windows or Android App. Offer can be redeemed only once per user per card and is applicable for the Add Money payment done during the offer period on MobiKwik App. Offer will be valid only for the transactions done through Cash pickup, Debit Card or Credit Card. Not valid on Net Banking and Virtual Cards. Offer valid for all MobiKwik user only. Valid till 10 PM (i.e 27th October’15). Valid till 6pm on cash pickup. Cash pick up available in Bangalore, Delhi/NCR, Jaipur and Mumbai. Cashback will be automatically credited within 24 Hours. Offer can be called off any time on the sole discretion of MobiKwik.